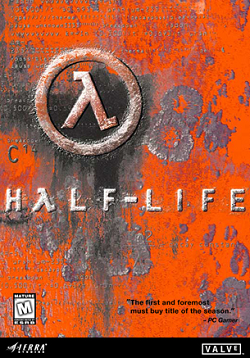 In this review, we experiment with the FPS game Half-Life. We find out if this PC game lives up to the hype. This game was released in 1998 and would be one of the more easily recognizable FPS games. In the game, you take the roll of Gordon Freeman, a theoretical physicist who is apparently late for work at the Black Mesa research Facility. You take a train ride through the facility to your destination. You make your way through the hallways with scientists and guards everywhere. After you don your hazard suit and eventually get to “the tube” which is a massive test chamber. After pushing a tray into the core of the room, something goes horribly wrong. Explosions occur and rips appear all throughout the facility. These rips allow aliens from another dimension to attack the facility. Your mission is clear – get to the surface to call for help. The game comes with a tutorial mode. This turns out to be much more useful than you would initially think and helps clear up some of the questions you’ll eventually have in this game. Ideally, complete that mission to know pretty much every aspect of movement in the game. You also have your levels of difficulty that you can try out before starting the game. Importantly, you can save anywhere in the game as well. After getting your suit, there are two important items on the HUD: Health and armor. Health goes up to 100, but if you run out, you’re dead. Armor comes in the form of power. That also goes all the way up to 100. Armor can absorb some of the damage you take from enemies. Sometimes, it can completely absorb weaker attacks. Once you are out of armor, all damage will automatically go to health. There are two ways to recharge both: item pickups and recharge stations. For armor, you can pick up batteries. Since we’ve decided to try this game on easy, these numbers are based off of this difficulty. Each battery you pick up will net you 15 points. There are also medkits that you can pick up. Each medkit will replenish 30 health points. Throughout the game, you’ll encounter many recharge stations. The most common are health recharging stations. Each health station carries 50 health. The energy stations are far less common, but if you find one, you can replenish 75 armor. Later in the game, there are also recharging pools and rooms that seem to offer unlimited health, however, regeneration takes longer. Another important thing about the HUD is the weapons system. If you’ve played the later game Max Payne you’ll notice the similarities when it comes to organizing weapons. Weapons are separated into categories. You can scroll through the weapons further by hitting the number button multiple times (or you can just scroll through the mall via tab). In the first category, for instance, you can utilize the only weapon in this category: a crowbar. What is very useful about the crowbar is the fact that you don’t use ammo and it’s available immediately in the game. This weapon can break the many breakables found throughout the game. These breakables can either be containers that can contain something (i.e. batteries, health, or ammo) or the breakables can obstruct your path (i.e. weak grating or glass). As you make your way through the game, you’ll encounter a large arsenal of weapons. This can range from the pistol to the machine gun to even the rocket launcher. Like the game Blood, some of these weapons have a secondary firing system. This increases the versatility and usefulness of these weapons. For instance, the machine gun can also fire grenades – thus doubling as a grenade launcher. Not every weapon can be fired. One weapon, for instance, can be placed as a trap. These are laser trip bombs. Like Duke Nukem 3D, all you have to do is find a wall and place the bomb. If anything disrupts the laser (whether it be you, an enemy, or a breakable getting destroyed), it will set off the bomb. Most weapons that you fire have a limited supply of ammo. If you pick up one of the many ammo drops, you can replenish a certain ammo type. Note that some weapons share the same kind of ammo, so using up the ammo of one will affect the supply you have of another (minus whatever happens to be in the weapons magazine/chamber of course). One feature of this game is the interconnected levels. While there are chapters, almost every level leads into another. This style of gameplay for FPS games was becoming common by this time and is a feature shared with Blood II – The Chosen. While most of the game involves you running from one point to another in the game, you’ll sometimes encounter puzzles along the way. Unlike many FPS games that have been made in the years before this game, this game surprisingly does away with keys altogether. The closest thing to the key system is getting a guard or scientist to unlock a door for you. While it is different, it does make the game less varied because little was done to replace the key system. A vast majority of the puzzles that you do encounter revolve around you jumping from one platform to another or avoiding instant death hazards such as tentacles and crushing devices. Less lethal puzzles such as the laser puzzle do make appearances, but make up a very small portion of the game. Impeding your progress are also a host of enemies. These enemies are generally divided into three categories: aliens, humans, and machinery. You initially take on weaker aliens, but you’ll also encounter human enemies as well. Later on, you’ll also encounter gun emplacements and even full-fledged tanks. While there are alien space craft in this game, they are probably the rarest vehicles you’ll encounter in the game. Also helping you along are small gun emplacements that you can take control. These emplacements can be machine guns to small cannons which are useful for knocking down locked doors. With the occasional rail sled, the ability to drive and fire small machines is basically a scaled down feature of what was found in Shadow Warrior. So, here’s where I stood at the beginning of the game: I read up on how this was supposed to be one of the greatest video games ever made. Someone had commented that it wasn’t just the best game of the year, but the best game of any year. So, I started the game up with this in mind having high expectations that this was going to be a great addition to a top 10 list at the end of the year. During the introductory train ride, I was moving around in the car getting used to some of the movements and looking around at the scenery. The train ride apparently involved doors that are timed to a specific moment in the opening. In the process of moving around, I apparently managed to just barely step outside of the train before reaching the final destination. I stopped it right in front of one of the many doors that you encounter. The train didn’t move even though the door was opened, and the door closed back up again. I had finally managed to get back into the train to allow it to move again, but little did I know, this actually screwed something critical up. the train simply moved through the closed door, but my character can’t actually pass through the door as well. As a result, I was pushed to the back of the train and the car stopped when I reached the back of it. In short, the greatest game of all time broke long before I had even encountered my first enemy. I looked around and discovered that this was actually not a common occurrence for most players. So, I chalked this up to maybe this being a fluke and moved on. As it turns out, movement in this game is actually often buggy. My character got stuck on a lot of things. Sometimes it was on a box, sometimes it was on elevators, occasionally I was stuck on switches, and I even got stuck on a wall while accidentally tagging one of those ceiling enemies. Sometimes I get lucky and it’s only a matter of smashing the breakable or re-hitting a switch, but other times, I’m forced to reload where the game last saved because I’m stuck on an immovable or unbreakable object. My theory is that the game thinks my character is in the air when he really isn’t. Buggy movement isn’t exclusive to my character getting stuck. The long jump is also really frustrating on surfaces that aren’t even. Sometimes my character just barely catches some air while running and disables the long jump right when I was expecting to jump. Other times, a slight sideways slope deflects my jump into a random direction. In addition to that, stairs are apparently slippery because I’ve lost count how many times a simple step onto the top stair sends me all the way down the rest of the flight of stairs. Jumping out of the water can also be a bit unnecessarily finicky as well. Even the trampolines sometimes don’t work as they should. I’ve run over these things numerous times and had many instances where the trampoline goes off and my character doesn’t even get off the ground. At any rate, movement can be an extremely buggy thing in this game to the point of making it impossible for you to move (yes, I’ve tried ducking and jumping). On a more positive note, I did think some of the weaponry was rather creative. The ability to throw exploding aliens at human enemies was a rather interesting concept. The puzzles here can be a bit repetitive. It wasn’t until towards the end of the game where puzzles actually start getting creative, but even then, the puzzles don’t last long in the grand scheme of things because you are facing the final boss shortly after. Yes, the game got rid of keys and keycards. Unfortunately, after this attempt to differentiate itself from other games, the game doesn’t really replace it with something substantial. As a result, the game is actually just stripped down in that respect. In fact, this game features a lot of stripped down features found in other games. Apart from possibly the weapons category, I don’t really see where this game was all that innovative. The game is large, but so were a number of other games made in the same year such as Body Harvest, Blood II – The Chosen, The Legend of Zelda – Ocarina of Time, and Turok 2 – Seeds of Evil. This game does step up the size, but so did a lot of other games at the time. As I discovered over the last few years, just because a game is really long doesn’t necessarily mean it’s a great game. Some games are long and great while others are long and provides little more than a mediocre experience. The beginning few chapters were interesting, but the middle of the game relies to heavily on that ‘one misstep and your dead’ system. In fact, I started getting bored when I reached that level with all the conveyor belts shortly after the kidnapping scene. Thankfully, the next few chapters weren’t like that, so I didn’t just escaped out of the game out of being bored, but the game did have a couple of moments where I started thinking that I wanted to just throw in the towel for this game because I wasn’t being entertained enough. Another thing I noticed was the general lack of inventory items. Numerous first person shooter games have special inventory items such as night vision goggles, portable medkits, and other forms of power-ups that you can use at your disposal. I was quite surprised this game didn’t have that. Instead, for items, all you had was the shoulder flashlight that you had at all times and the long jump pack that you only get near the end of the game. For quite some time in this game, I couldn’t help but think there was something actually missing in this game. This, as it turns out, was what I felt was missing. So, there are highs and lows to be had in this game. Already, for a game that is supposed to be one of the greatest games ever produced, I found myself quite disappointed by the experience. It ends up being a very middle of the road experience for me. Graphically, I was told that this game sets the gold standard for graphics. So, when I went into this game, I was surprised that the textures in the game were so spectacularly low grade. The pixels were so large, I thought, at times, I was playing a game released in 1996 along with Quake. Even a number of special effects (i.e. smoke, fire, etc.) suffer from heavily pixelation. From the textures alone, I’d say that there are plenty of games out there by this time that did a much better job on this front. The pixelation isn’t exclusive to textures either. If you are underwater or the screen fades from black, etc., everything becomes heavily pixelated. If you go underwater, look at the gun you are holding. I don’t know why the heavy pixelation, but I thought that this wasn’t video game graphics’ finest hours. This is not to say the graphics are all bad in this game. I think the developers knew the textures were very heavily compressed, so a lot of rooms were made to be really big. If you have a good amount of distance between you and everything else, the pixelation becomes less noticeable. So, at least there was an attempt to cover things up. Another positive is the model movements – specifically around speech. Most games that I’m aware of simply makes models wave hands around when the character is talking. In this case, I saw mouths moving while characters were talking. This aspect did permit me to give a thumbs up. So, the graphics weren’t all bad, but not something that would make me jump up and down excited in any way simply because there were games with far better graphics in the same year (i.e. Banjo Kazooie, The Legend of Zelda – Ocarina of Time, or Top Gear Overdrive with the chrome effects and reflection). Audio was interesting in this game. There wasn’t a whole lot in terms of music in the actual game, but there were some elements here and there. While it was ambient and mood setting, I don’t know about anything being that memorable. The voice acting found in this game was nicely done. The sound effects can be a bit hit and miss. The gun fire and general folly sound effects were pretty well done, but in some areas of the game, it sounded like I was jumping up and down on a guitar. I thought the guitar echoing was more strange than interesting. Overall, I was told that this was one of the greatest games ever made. My experience with this game is that this falls far short of that. It isn’t the best game made in any year. It isn’t the best game made that year. It isn’t even the best FPS PC game made that year. The game does have some interesting features, but almost all of them are stripped down versions of what I found in other games made in the same year or earlier. The only feature I found in this game that I don’t recall a previous game doing was the categorizing of the weapons. Even then, I’m not entirely convinced this was the first game to categorize weapons in this manner either. The models did have some great things going for them in the graphics department, but the low quality textures stole the show a lot. Part way through the game, I even found myself starting to get bored of the gameplay. So, at the end of the day, this game wasn’t terrible, but it was highly overrated. Furthest point in game: Beat the game on easy.